Brahman Systems CEO has been featured on a number of networks, including most recently Fox Business and CNBC on the show, "21st Century Business". To see a video of Brahman's CEO, Mike James, being interviewed on Fox Business Channel, click here. Brahman Systems are used for temporary protection of hoses and cables on road crossings. They improve the safety and eliminate the cost of burying hoses and cables, stringing them overhead, or building a ramp from nailed-together scaffold boards. No longer do you have to worry about disturbing the environment through trenching, or having scaffold boards splinter, with nails backing out and causing flat tires. 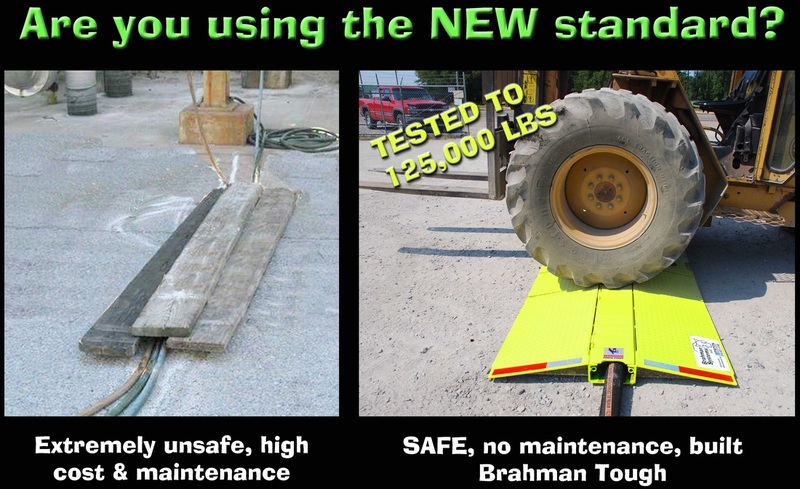 What else makes Brahman Systems the best kind of cable protectors on the market? If you're looking for a cable & hose protector that exceeds your needs while fitting under your budget, then call 225-637-3700 today. Download whitepaper "Issues in Temporary Hose & Cable Protection" here.